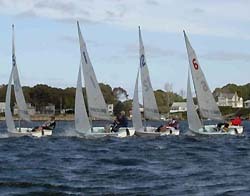 The URI Sailing Team Alumni Regatta is setting up to be a great event this year. The event will be hosted a week later this year to help accomidate all that are members of the marine industry. As usual, it will only take one URI Sailing Team Alumn to qualify you for the Grand Prix Division. The division will be sailed in the team FJs and a minimum weight will be enforced before registration (this is to “stop the pinners from taking over the event”). Not to worry we will supply weights to carry in your boat if you happen to be under weight. Sailing team members are also available as crews; there is a limited number so make sure to contact Joey ASAP to get a crew. Feel free to come early register and catch up with old friends. During registration we will hold boat draw and mandatory weigh ins. We will bump up the time of the skippers meeting and first race, SO DON’T BE LATE. Following the day of racing, we will have the grill going and will be serving a great dinner with a variety of sides for all competitors. All food will be served at the sailing center prior to an awards ceremony. Following awards there may be a gathering at a local establishment, directions will be given during the awards ceremony. 300 lb. Crews may be available, get your request in early! !